Everything Goat Milk: The BEST site for goat milk information and products. So many benefits...so little time! Thanks so much Maria! I LOVE your website!!!! I'm learning so much! I have bookmarked it in my favorites and put a link on my desktop however, I was so into it I haven't closed it since I found it... so much info! Thank you! Just wanted to say your site is awesome. My son is allergic to both cow milk and soy so this is awesome. He's just getting old enough to eat solid food so this is like finding a gold mine to me. 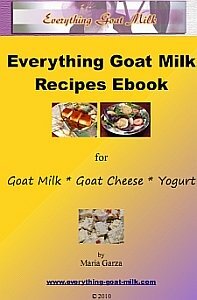 This is the only place I have been able to find recipes using goat milk. Thank you so much for putting this all together! I had never used goat milk til now so all the information has been so very helpful. Thank you again. What other substance can make all those claims? We're here with the answers! Click on the image above to see how you can get all the articles from this website in a convenient ebook! Once considered a "poor man's" milk, this healthy drink has enjoyed a steady rise in status. The chevre that originated in the peasant's cottage and the nomad's tent now graces fine dining tables around the world. And, modern nutritional analysis has provided a scientific basis for many of the "alleged" health benefits passed down by mouth for generations. However, a few gallons of milk and several containers of homemade chevre later, I was hooked on the delicious potential of my newfound "liquid (white) gold." At that time, I didn't know all about the supposed nutritional benefits, or that it was the basis for healthy soaps, lotions and even nutritional supplements. As I learned, I became the local advocate, sharing delicious cheese and recipes at any opportunity. Unfortunately, many people still have prejudiced ideas about goat milk and its products being less than palatable. Nothing could be further from the truth! I've created this website to help provide accurate information on the full spectrum of the benefits and uses of this wonderful natural substance. That's quite a task — and new articles are added every week. So, check back often to read the latest, or subscribe to our blog or newsletter in order not to miss anything! NEW! When you subscribe to our newsletter, you'll receive a FREE 39-page ebook containing all the recipes on this site using goat milk, goat cheese and yogurt! That's over 20 recipes in an easy-to-use format! Browse through the categories on the left. Whether the topic is homemade yogurt or cheeses, delicious recipes, nutritional information or skin care, you're sure to learn something that you didn't know before. Or, if you prefer, use the sitemap to go directly to an article of interest, or the site search to view all articles related to a word or phrase. Want more articles on a particular topic? Tell us by taking our preference survey! The sitemap to Everything Goat Milk will take you directly to any page of interest. The Everything Goat Milk Blog contains frequently updated tidbits of information of interest to goat milk lovers everywhere. Making your own skin care recipes with dairy products is probably the best thing you can do for your skin! The natural way to softer, smoother, healthier skin is easy and inexpensive. These delicious, original goat milk recipes with illustrated directions will help you create a truly special dish. Whether it's cajeta, goat milk fudge, flan or other, you'll love these recipes! Check out these delicious, original goat cheese recipes that cover the entire meal--from appetizer and main meal to dessert. You won't find a better collection anywhere else! Our page of visitor-submitted homemade ice cream recipes using goat milk. You'll love the extra creamy texture and delicious taste of goat milk ice cream! Delicious yogurt recipes for dips, desserts, entrees, salads and drinks! Learn how to add this healthy dairy product to your daily diet in a multitude of mouthwatering ways. These frozen yogurt recipes using goat milk yogurt will help keep you cool AND healthy. Submitted by our visitors, you can choose the flavor that fits your style best! Goat cheese making is a fun and delicious hobby. This article will get you started with everything you need to know to make many delicious varieties of your own goat cheese. You'll find cheese making recipes for a variety of goat cheeses in this article with easy-to-follow, illustrated instructions. Goat cheese is world-renowned for its delightful texture and taste. Read this article to find out why goat cheeses are unique in the realm of dairy products. Delicious goat milk products aren't limited to cheese. This article will get you started on other wonderful culinary delights, such as butter, yogurt, buttermilk and more! What is kefir? This article will explain the basics on this ancient cultured product with the strange name. Find out why this is probably the single most important food you can add to your diet! Milk nutrition facts for goat milk explained in practical terms. Find out in detail how goat milk supplies many important nutrients and what they mean to you! Curious about the health benefits of goat milk and whether you might benefit from using this ancient folk remedy? Read this article to learn more about goat milk benefits. The basics of home milk processing are not difficult to master. Learn how to properly handle and store your fresh goat milk. Find milk processing equipment for collecting, straining and pasteurizing your milk. Learn more about the story behind the website Everything-Goat-Milk.Com. Contact us at Everything Goat Milk to tell us your opinions, ideas and feedback on our website. 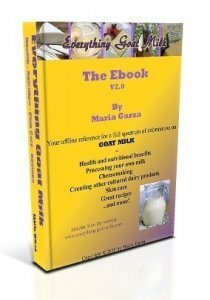 The Everything Goat Milk Ebook v 2.0 is 214 pages packed with information on goat milk for nutrition, cheesemaking, skin care, recipes and more! Get your copy now! The e-Goat Milk Minute Newsletter will give you great tips and ideas on nutrition, recipes, cheesemaking and more - in under a minute! Simply Soap Goat Milk Soap is exactly that--a pure and natural soap without any additives or fragrance. Made with shea butter, the creamy lather gently cleanses without drying.